It’s time to write about the season that ended again. I feel that every year I start these with the same phrase: it’s been a hard season for the team, and it feels kind of silly. To be honest though it really feels like that again. Maybe it’s because we didn’t quite reach our set goals or that we lost our own field and had to renew our training methods. Whatever the reasons this year wasn’t easy for any of us and yet it still managed to be a great year of fun. Here’s a rundown on the dramatic turn of events. We had to give our field Tuusula Grind away for the same stupid reasons that most paintball fields are lost. Someone wrote a letter to the local newspaper that we were a bunch of warmongers and crazies drinking beer and shouting on the field. Even as this was all untrue it didn’t stop the owners of the land from panicking and throwing us out. There might be a more detailed writing coming up later… if I get around to writing it. Because of this we had to figure out our training again and we had to give up our three times a week schedule. We ended up training in the Sissos Bunker for the winter season and moving our turf to the ProGames Propark in Kirkkonummi. The turf was built with the co-operation of Field Fighter Paintball Club and is now for the benefit of all Finnish paintball teams. It’s by far the best field in all of Finland. This was not completely pro bono since our benefit is a deal with ProGames to use the field for a certain period of time but the big point here is that no money changed hands and all work was done by paintballers for the love of the sport. 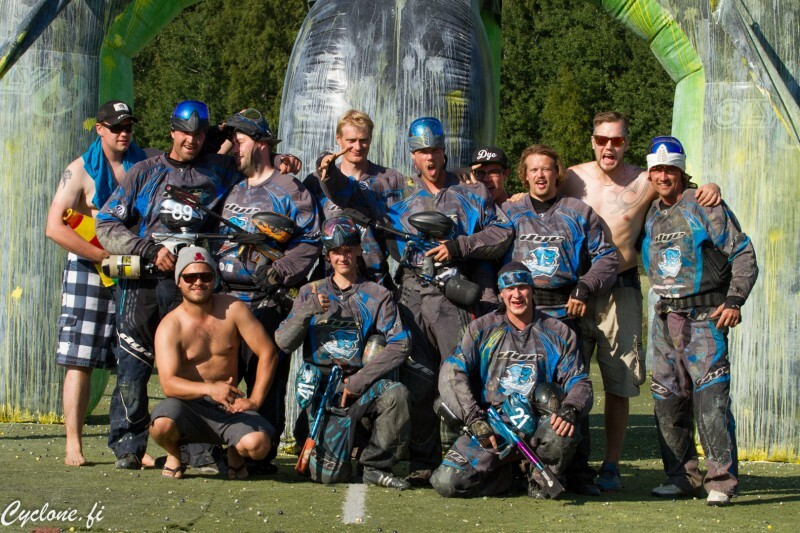 So Finnish paintballers all over the country, you’re welcome and you might want to reconsider your views on FF not being a Finnish team. This year we decided that we’d take it easy in the Finnish tournament scene and that we would continue our baby steps abroad. The plan was to play 1-2 Millenniums on top of the Finnish league. It didn’t quite go as we thought. We ended up playing more tournaments than the team has played in years. Before the season started we visited the Moscow Ice Ball, during the spring we played the two Sissos Winter Series tournaments and in the summer we played the Finnish league with two teams, the whole Baltic Sea Cup and the Campaign Cup in Basildon. We even thought long and hard about the last Millennium leg but simply ran out of money. It’s now evident that the new players of Cyclone are as hungry as the old used to be and we’ll be making our comeback on the European scene very soon. This year we were a bit lazy. I’m not even going to review our physics training since it was basically done only by certain individuals of the team. Paintball sessions we had 43 and within those sessions we shot 438 cases of paint on someone’s face. We played 6 Countries, 10 cities and 12 tournament plus one, as our own Sami Turunen has just came home from playing in the Asia World Cup with the team Anthrax Regian. The numbers for the paint shot in tournaments I don’t have since the organizers tend to send only the sums with the bills, but I’d say it’s about 300-400 cases. So you might say we kept busy. With Sissos everything just works, we get to test numerous different paints before every tournament to find the best paint to use. I don’t know how we lived without this service. For a bonus we edited our shenanigans caught on tape throughout the year. Enjoy. 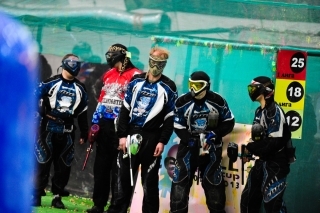 Finnish paintballers tend to say that it always rains in Turku… We’ve been saying this for ten years and it hasn’t failed yet. However, In my opinion a new saying should be introduced now for Kirkkonummi: It’s always blistering hot in Kirkkonummi. Yet again the tournament was played in the very best of beach weather the Finnish climate can produce; this of course being perfect for all the spectators but not so nice for the guys running around the field wearing neoprene pads and a plastic bucket on their heads. ProPark has also evolved a great deal since last year by getting a new turf on the field. 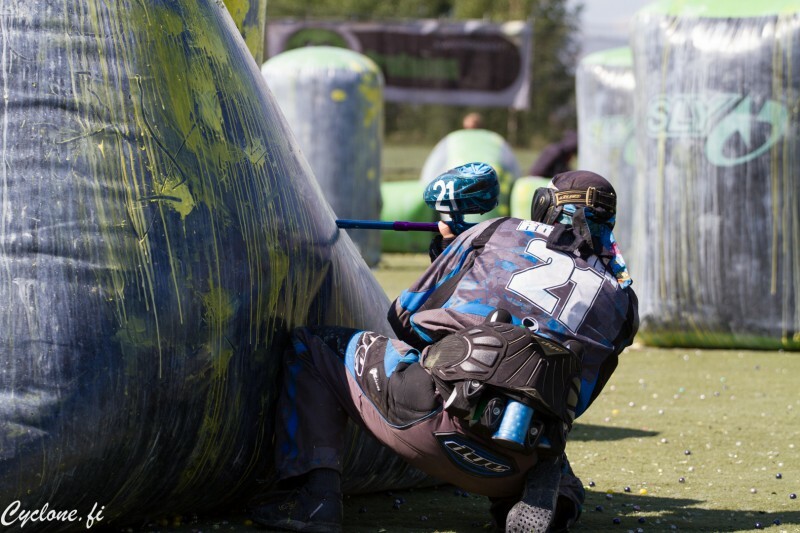 The turf was actually installed only a month ago in cooperation with ProGames, Field Fighter Paintball Club and Helsinki Cyclone making it by far the best paintball park in Finland. As always, Cyclone had two teams for the tournament, a league team and a 1.division team. The league team was a mix of old and new with Jani Kalasniemi #12 representing the newest additions, Wilhe Knaapi #88 and Tomi Lindholm #17 representing the present and Sami Turunen #5-0, Mikko Sipiläinen #13, Toni Sireni #03 and Raffe Berg #07 representing the old school Cyclone. The 1.Division team was an even bigger mix with our 14 year old junior Ilmari Häkkinen #41 representing the youngest and Aleksi Peltonen #89 representing the oldest crew. To put this in perspective think about the fact that Aleksi had won his first Finnish League Championship title before Ilmari was even born! Accompanying these guys were Olli Kemppi #37, Pekka Roininen #21, Jarmo Nieminen #87, Markku Uotila #02 and Patrik Louko #01.On top of this bunch we had a special guest superstar from Dye, Hidde Feenstra (in the pics he’s playing with the number #33). After a tournament the first thing you need to do is get all the dirt off your body and the best way to do this is of course sauna. Cyclone recommends the Kulttuurisauna at Merihaka. This is a public Sauna built for Helsinki’s Design Capital year. This place is absolutely gorgeous, it’s warmed with wood pellets and you can swim in the ocean. You need 15€ to get in, a towel of your own (rented towel is 4€) and swimming trunks. Alcohol is not allowed in. It’s not directly in the center but it’s not far away either. You can walk, use public transportation (metro, trams and buses stop at Hakaniemi) or take a taxi which will cost about 10€ from the center. Ilves (or bobcat) is a bar in Kamppi. It serves damn good burgers, steaks, salads etc.. And since it’s a bar you don’t even have to find another place to sit and tell war stories. The best pizza in Helsinki. Pizzas are made the real Italian way and you really can taste it. Just like Ilves, it’s a bar as well. Kitch is more like bistro then a bar but still with good food and none of the restaurant hassle. Tapas, burgers, salads, steaks etc. from here as well. Since it’s summer you can find good terraces all around the city, but there is only one Mbar. The Mbar terrace is the coolest, hippest and best terrace of them all. Dj’s, live music and a great party every night the sun shines (and even if it doesn’t). The terrace is located on the courtyard of Lasipalatsi. It’s right next to another terrace called Laituri, but you don’t wan’t to go there. Like I said there is only one Mbar. When the evening turns into night you need the Club and Maxine is it. We haven’t actually tested this yet but since Helsinki Cyclone’s own Niclas Belfrage is on the case, it’s going to be good. On the top floor of Kamppi center Maxine has the best club spot of the whole city. The unofficial player’s party of Kirkkonummi Finnish League will be held at Maxine Saturday 27th of July. Contact Helsinki Cyclone players for details!!! 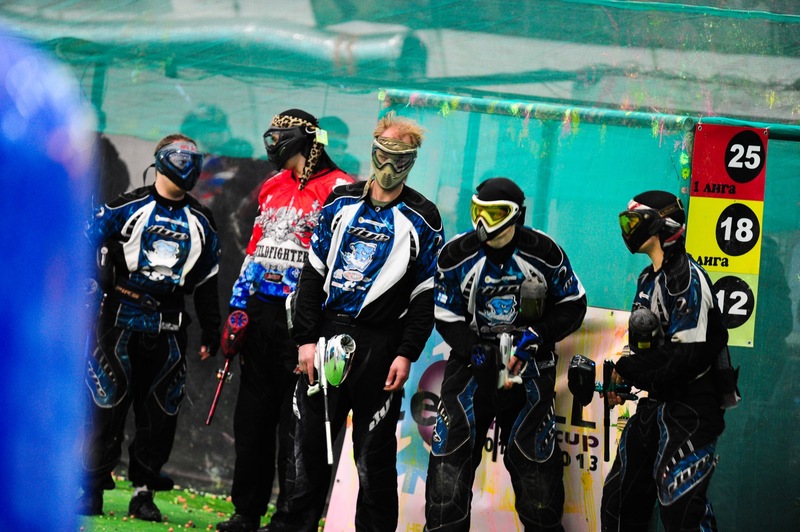 Throughout the years Helsinki Cyclone has travelled the paintball world using all transport modes possible. One of the meanest and also on of the most memorable would be the trip to Paris 7-man world cup with a car in one and a half days. That’s 2400km and it has a ferry on the way, do the math. That trip could be labeled with a Finnish paintball phrase “fastly and efficiently”… And yes, many of you know we hate that sort of trips. Occasionally though they have their advantages and their own twisted sort of fun. This was one of those times.The Iceball arena cup was to be held in Moscow on the third weekend of December and our good friends theField Fighter boys asked if we were interested in a joint team effort for the tournament. This would not only mean that we’d get to participate in the tournament but also see Moscow with a someonewho speaks the language… Surprise surprise, we said yes.